A quiet and humble lay brother in the newly found Redemptorist order, St. Gerard Majella did not display his great mystical gifts until the last three years of his life. Before his early death at the age of twenty-nine, he was known as “The Wonderworker of the Eighteenth Century”, for his ability to read consciences, predict the future, be in two places at once, heal the dying and infuse his surroundings with serenity. He is most invoked by women who want to conceive a child and though there are many different novenas to him, The Prayer for Motherhood is particularly popular throughout the world. Born in a town south of Naples to a tailor and his wife, Gerard was a sickly child, contemplative by nature. At the age of twelve, his father died, plunging his family into poverty. Gerard was apprenticed to a tailor in order to support his mother and three sisters. He suffered brutally at the hands of this abusive man and eventually got a job as a servant for the local bishop. His hopes of entering the Capuchin order were dashed due to his poor health. Upon returning home, his devout nature and his kindness, especially to children, was noticed by St. Alphonsus Liguori, the founder of the Redemptorist order. He invited Gerard to join as a lay brother and work in the slums among the poor. It was while he was serving on this mission that Gerard faced the greatest challenge of his life. A young woman accused him of fathering her unborn child. When Gerard refused to comment on these charges or defend himself, the Redemptorists had no choice but to deprive him of the privilege of working with them. Months later when the woman admitted that she had lied, a bewildered Alphonse Liguori asked Gerard why he had remained silent. He answered that he had complete faith in God and that silence was the only answer to unjust accusations. Raised as the only male in a household of women, St. Gerard was particularly sensitive to the problems women had in conceiving and giving birth. While visiting family friends, he dropped his handkerchief while leaving. The young woman of the family ran to give it to him and he refused to take it saying, “Keep it. One day it will be of service to you.” Though puzzled, she did as he said. Years later, while dying in childbirth she remembered his words and had the handkerchief brought to her and placed on her womb. All deadly complications stopped and she gave birth to a healthy baby. The handkerchief of St. Gerard’s was passed from mother to mother until his canonization in 1904. The remaining shred is still used to bless relics for those seeking to conceive a child or have a safe delivery. O good St Gerard, powerful intercessor before God and wonder worker of our day, confidently I call upon you and seek your aid. On Earth you always fulfilled God’s designs, help me now to do the holy will of God. Implore the Master of Life, from whom all paternity proceeds, to render me fruitful in offspring, that I may raise up children to God in this life, and in the world to come, heirs to the Kingdom of His Glory. 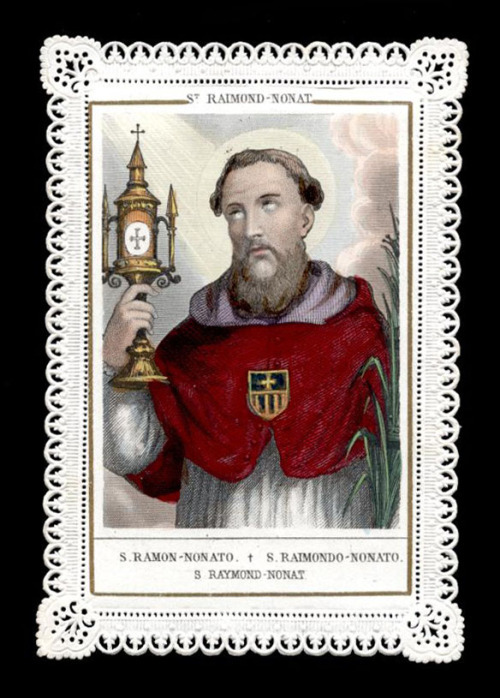 ‘Non natus’ is Latin for “never born” and Saint Raymond was given his surname because his mother had died in labor two days before he was delivered by cesarean section. The fact that he did not die in his mother’s womb was considered an extraordinary event in the early thirteenth century, when a good number of mothers and infants were lost during childbirth. Because of the extraordinary circumstances of his birth, he always felt an affinity for the precarious state of women in labor and their infants. For this reason, midwives, obstetricians and expectant mothers call on him for help in the safe delivery of healthy newborns. Hailing from Catalonia in Spain, Raymond’s family were from a noble class. His father attempted to train him to take over the family farms but because of his great devotion to the Virgin Mary, he chose instead to join the Mercedarians, a religious order dedicated to ransoming Christian slaves from the Moors, who occupied much of Spain. The Mercedarians also spiritually administered to Christian slaves in Moorish regions. As the Spanish territory was recaptured, and the Moors driven into North Africa, Raymond Nonnatus followed Christian slaves into Algeria. It was said he spent his entire inheritance ransoming slaves and when he ran out of money he substituted himself for another man’s freedom. He was soon imprisoned for his religious proselytizing and when he succeeded in converting several of his jailers, the Moors bored holes in his lips and sealed his mouth shut with an iron padlock to keep him from preaching. Though he was sentenced to death, the Mercedarians managed to ransom him home to Spain. As he was enroute to Rome to receive the hat of a cardinal, he was struck down by a fever and died in Cardona, 60 miles from Barcelonia. It was said that angels fed and administered communion to Raymond on his deathbed and he is frequently depicted in the company of angels. Because of the padlock put on his lips, Raymond Nonnatus is invoked against gossip and the temptation to gossip. He is also invoked for help in keeping secrets as well as by priests for protection of keeping the sacred silence of the confessional. On the feast of Saint Raymond Nonnatus, it is customary for those who are victims of slander and gossip to put locks on the saint’s altar to silence their persecutors. In many images Saint Raymond Nonnatus carries the palm of martyrs signifying life defeating death, his palm has three crowns, for chastity, eloquence, and martyrdom. Glorious St. Raymond, filled with compassion for those who invoke thee and with love for those who suffer heavily leaden with the weight of my troubles, I cast myself at thy feet and humbly beg of thee to take the present affair which I recommend to thee under thy special protection. ( your request here) Vouchsafe to recommend it to the Blessed Virgin Mary and lay it before the Throne of Jesus, so that He may bring it to a happy issue. Cease not to intercede for me until my request is granted. Above all obtain for me the grace of one day beholding my God face to Face, and with thee and Mary and the saints praising and blessing to all eternity. Amen. Good St. Raymond, pray for us and obtain our request. Our Father, Hail Mary and Glory be. Though she was greatly hurt and disappointed by her firstborn son, St. Monica never gave up the idea that he would change his way of living. After 17 years of what seemed like fruitless prayers, her son turned his life around, converted to her faith and became one of the world’s greatest philosophers and Catholic saints, St. Augustine of Hippo. 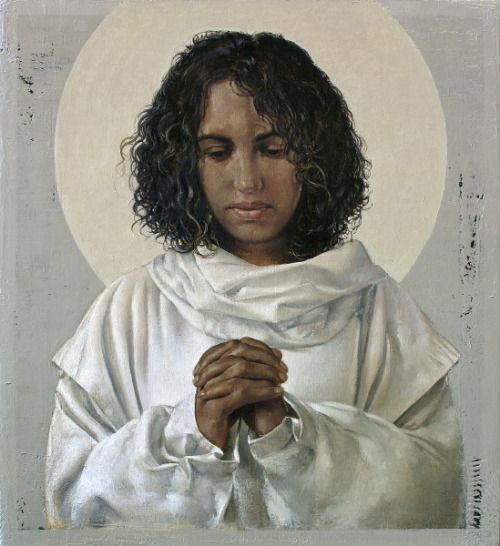 We invoke St. Monica to help us when our own children disappoint us. She serves as a reminder that there are no lost causes in this world and that absolutely anyone can reform and change their life. When Augustine openly took a mistress and further humiliated his mother by having an illegitimate son, Monica turned to her Bishop for help. He advised her to pray and be patient saying, “It is not possible that the son of so many tears should perish.” After the death of his father, Augustine decided to move to Rome to increase his worldly success, Monica vowed to follow him. In his own great treatise “Confessions”, Augustine relates how as his mother spent the night in prayer before their voyage, he tricked her and slipped away on an earlier ship. Devastated, she traveled to Rome anyway. By the time she arrived Augustine, had already left that city for Milan. By the time Monica tracked him down, she was overjoyed to find that Augustine was no longer a Manichean. He had met Ambrose, the bishop of Milan and was studying with him. Eventually, after several more years, Monica lived to see Augustine baptized a Christian. While waiting for a ship at Ostia to take mother and son back to Africa, Monica told her son that she had accomplished everything that she had set out to do in this life and did not need to live any longer. She died in Ostia, never returning to her native land. It is interesting to note that there are many great saints from Africa, especially the earliest ones and they are rarely depicted as anything but European in visage. Light from sky: Grace. Through prayer, Monica channeled grace to convert her son. Outstretched arms: pointing to Africa, her homeland. Palm tree: the shore of Ostia Antica, where Monica’s earthly life ended. Dear Saint Monica, once the sorrowing mother of a wayward son, be pleased to present our petition to the Lord God of heaven and earth. (Your intention here.) Look down upon our anxieties and needs, and intercede for us, as you did so fervently for Augustine, your firstborn. Grandparents are the foundation of a family and we invoke Saints Joachim and Ann for strength in every sort of family crisis. As parents of the Virgin Mary and the grandparents of Jesus Christ, they offer a vast array of earthly experiences relatable to every human being. Infertility, late parenthood, an unmarried pregnant daughter, a grandson who was imprisoned and executed, are all parts of their life together which they accepted with grace and dignity. Joachim and Ann are important as moral examples rather than truthful historical figures. According to legend, Joachim and Ann were married twenty years and still had not conceived a child. Living in Nazareth they were upstanding citizens, always tithing one third of their income to the temple. After many years, their barrenness was considered a form of divine judgment and eventually their contribution to the temple was refused and they were ostracized by their community. In shame, Joachim went off to live with his shepherds. There he was visited by an angel who told him, that Ann was pregnant with a child named Mary who was to be dedicated to the Lord. He was to return home and find his wife, who would be waiting at the golden gate, the entrance to the city. Doing as he was told, his joyful reunion with Ann at the golden gate has become a famous image in art history. Mary was raised according to the instructions of the angel, she was consecrated to the Lord at infancy and sent off to live in the temple, away from the world, at the age of three. Accepting this great sacrifice of giving up what is most cherished to God, Joachim and Ann acted out an almost impossible act of faith. Though Saint Ann was younger and lived much longer than her husband, she and Joachim are inseparable in sharing the important patronage of grandparents. A rare image of Joachim as an older father, and his wife, Ann, instructing the Virgin Mary. They are divinely inspired by the wisdom of the Holy Spirit. Saints Joachim and Ann, grandparents of Jesus and parents of Mary, we seek your intercession. We beg you to direct all our actions to the greater glory of God and the salvation of souls. Strengthen us when we are tempted, console us during our trials, help us when we are in need, be with us in life and in death. O divine savior, we thank you for having chosen saint Joachim and Ann to be the parents of our Blessed Mother Mary and so to be your beloved grandparents. We place ourselves under their patronage this day. We recommend to them our families, our children, and our grandchildren. Keep them from all spiritual and physical harm. Grant that they may ever grow in greater love of God and others. de for us before the throne of your divine grandson. All of us here have our special intentions, our own special needs, and we pray that through your intercession our prayers may be granted. Amen.